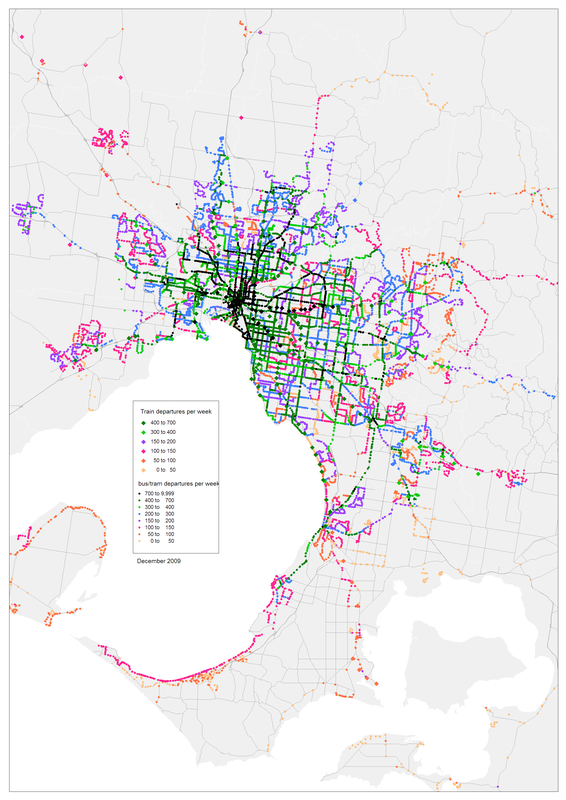 Just how much public transport service do people get in different parts of Melbourne? How can you visualise service provision across a city? Here is my attempt. Some routes run high frequencies, some run over a long span of hours, some do both. Some routes have lots of short trips that don’t run the full length. How do you translate all this into something that is meaningful? My preferred measure is simple: (one-direction) departures per stop or station per week. It reflects both span of hours and frequency of service (although it doesn’t differentiate between them). And by calculating this at the stop level, you account for trips that don’t run the full length of the route. Thanks to the recent release of public transport data by the Victorian government, I’ve been able to calculate the number of public transport departures per week per train, tram and bus stop for all of Victoria as at December 2009, and put them on a map. Below is a map for the Greater Melbourne area (to see the detail you will need to click to enlarge and then zoom-in further). I would love to see similar maps of other cities in Australia, if anyone is able to produce them (happy to host them on this blog). Similar Sydney public transport data is available here, but I haven’t looked to see if enough detail is available to produce a similar map. Inner Melbourne is blessed with lots of public transport (lots of black and dark green). Outer Melbourne – in particular suburbs created in recent decades – have relatively low levels of service (especially on buses). This probably largely reflects government transport priorities when they were established. Few of these have since been upgraded in frequency, although many have been upgraded in span of hours in recent years. In several outer suburbs of Melbourne there are some orange dots representing very low service levels – particularly around Narre Warren/Berwick, Mooroolbark and Lilydale, Upwey, Cranbourne and Frankston South. Unfortunately these too often correspond with areas of highest social need for public transport. The growth corridors in the north (Hume and Whittlsea) and Melton have relatively good levels of service (though there are coverage issues). Services in the Werribee area are soon to be upgraded. The Pakenham, Sunbury and Caroline Springs growth areas have lower service levels (not to mention coverage gaps), while the Casey growth has the some of the worst service levels of any growth area. Tram and bus stops almost always serve on travel direction only. Meanwhile, train departures are registered against a station, regardless of the direction. To make the numbers comparable, I have halved the number of departures at train stations (except end stations). This means the train stations are coloured by the average number of departures in each of two directions (and yes, Newport station shows up black because of the shuttles to Williamstown). Train stations arguably have more utility than bus or tram stops, as trains are generally much faster than the other modes. I’ve shown train stations with a larger diamond shape, and metro stations are always on top of bus and tram, even if service levels are lower. Some bus routes run in one direction in the morning, and the other direction in the afternoon. This means than the service per stop is split between both sides of the road and low values result for both stops. A good example is route 558 in north-western Reservoir which shows up in orange (for those who have a good grasp of Melbourne’s geography). There is arguably less utility in a service that only runs in one direction for half the day, so perhaps the low scores for these stops do reflect passenger utility. But then other one-way loop routes operate in the same direction all day (eg route 582 in Eltham, 775 in Frankston, 461 in Hillside) and their stops show up with more departures. Only fixed stop locations show up on TeleBus routes (in Mooroolbark/Lilydale and Rowville areas), but they still largely indicate the level of service for on-demand services. If you can make out Wellington Road, you’ll see occasional black dots. This is SmartBus route 900 that operates a limited stops service, overlapping with some local routes. There are dark green dots through Warrandyte where a number of services to Doncaster and the city overlap with services to Eltham. The bus services that parallel the Stony Point train line actually have more service than the train line (in many areas). The Upfield rail line shows up as having the lowest level of service of any near-city railway line (largely due to 20 minute peak headways). In a triangle between St Kilda, St Kilda Road and Caufield, there is a grid of high frequency services (of which the buses I suspect aren’t well-known). Across the middle northern suburbs you will see a few black east-west roads. These are from the red orbital SmartBus route 903 overlapping other frequent routes like 513 and 527. Between Frankston and Mornington, although route 788 has stopping restrictions which overplays the “catchable” service along the path. However there is essentially an all stops bus every 20 minutes between Frankston and Mornington, seven days a week until 10pm. In the middle eastern suburbs you can see several long north-south routes that are green – these are the SmartBus routes along Warrigal Road, Blackburn Road, Springvale Road and Stud Road. The Trainlink service to Cranbourne East shows up with several green dots (in contrast to low service in Cranbourne West). The Western Highway out to Caroline Springs. People like to joke that Caroline Springs does not have any public transport. The truth is that some parts are well serviced by routes 216 and 456 (although they don’t operate to a even combined headway). Meanwhile newer parts of Caroline Springs are not yet within walking distance of public transport. Belmore Road (Kew/Balywn) gets high frequency services from three overlapping bus routes (201, 202, 302) however they run to different destinations (the city, Kew, Doncaster and Box Hill). Between St Kilda and Brighton Beach and between Sandringham and Black Rock several routes overlap to provide a high frequency service (216, 600, 922, 923). Along Princes Highway between Oakleigh Station and Monash University Clayton (routes 800, 802, 804, 862 provide 7 buses an hour). Between Lilydale Station and Chirnside Park Shopping Centre (serviced by many routes). Buckley Street in Essendon/Keilor East has a very high frequency service (SmartBus 903 overlapping with the relatively high frequency 465). Most bus routes around Footscray are high frequency (some are more frequent than the tram route 82 between Footscray and Moonee Ponds). In particular, there are several high frequency corridors between Footscray and Sunshine. These bus routes are well patronised. Thompsons and Doncaster Roads leading into the Eastern Freeway. Route 250 which runs through Clifton Hill to Latrobe University Bundoora, with various other routes overlapping in different sections. At the other end it combines with 251 and 253 to provide a weekday 10 minute service to City Road and Bay Street Port Melbourne. Between Dandenong and the western edge of Endeavour Hills where overlapping routes then split (15 minute headways on weekdays). Sometimes the departures per stop on each side of the road just straddle the colour blocks on the legend. The better served stops appear on top (eg Lorimer Street in Fishermans Bend, route 534 in Glenroy, route 664 near Croydon). You will see the occasional light orange dot in the inner suburbs. These are usually NightRider bus stops. Between Port Melbourne and St Kilda you will see the low-frequency peak-only 606 bus service crossing high-frequency tram and bus lines. Bus services in Melton and between Melton and Sunshine are currently less frequent than the train service to Melton (which one day might be electrified and duplicated for metro train services). Most other light orange dot strings are either occasional deviations, industrial area peak-only services, low-frequency urban fringe services, or just low-frequency urban routes (eg Upwey, Cranbourne west, Frankston, Aspendale, Wantirna/Knoxfield, East Mitcham). At the northern edge of the map you can see Wallan, with it’s town service. This entry was posted on Saturday, March 20th, 2010 at 7:52 pm and is filed under Melbourne. You can follow any responses to this entry through the RSS 2.0 feed. You can leave a response, or trackback from your own site. Interesting, Chris. For interest’s sake, I did a quick calculation of the expected departures per week for a service running on the PTUA’s ‘Every 10 Minutes to Everywhere’ model. Assuming 6 services per hour, 18 hours a day, 7 days a week, this works out to just over 750 departures per week, which is pretty much your threshold for the highest ‘black dot’ level of service (for buses and trams at any rate). Meanwhile ‘pink dot’ service, for example (the highest service level available south of Mornington) represents some 15 to 20 per cent of the ideal service level according to this benchmark. Light green dots represent around 50 per cent of ideal. It would be interesting to look at a directional version of this, to assess the quality of the actual network available. Locations where there are services in only one direction would then rate below those where you can travel in all available directions, even where the individual services run at similar frequencies. Of course this complicates things as you’d need to locate stops in proximity to one another on different routes. 1. I take it that the stats are based at bus arrivals at particular stop IDs. If so shared stop IDs (eg Doncaster Park & Ride) and dynamic bus bays will show as being very high service. 2. Readability of the map and key. Only mentioned at all as this blog is graphical. Especially when the map is blown up it helps to memorise the key (or maybe have it on a seperate window or screen). Otherwise maybe the graduations between low and high could be done in a colour sequence people know (eg ROYGBIV – colours of rainbow/wavelength of light). Alternatively classified into 3 groups of 3 eg various shades of green (high service), various shades of blue (moderate) and various shades of red (low service). Your key is actually very close to that already – light violet could be used instead of pink would complete it. This is based on people not being able to remember more than 3 colours for a key, but they could detect 2 or 3 variations in each until it gets messy. Could a rule like this be useful for future charts? Note that this doesn’t factor in the non-standard weekend network although in most cases this preserves the hourly frequency. c. Perth local standard (eg northern suburbs). Similar to Canberra except there’s a more frequent peak service. Sunday services may be less frequent. e. Melbourne SmartBus standard (15 min M-F until 9pm, 30 min evenings/weekends and slightly better span than Go Zone): 390 approx. Also similar to Perth’s Route 900 series. f. Melbourne tram: SmartBus x 150% (approx) with better peak/weekend/evening frequencies and Sunday spans. Something like Route 19 would be triple SmartBus service. g. Melbourne train: Less than SmartBus in northern/western suburbs but higher in south and east (depends on 15 min weekday frequency). But always better weekend services. h. Brisbane’s BUZ zones. Maybe comparable to Melbourne trams (at least for off-peak & evening service – eg every 15 min until 11pm). There are two service level areas of particular interest in Melbourne – high service routes and middle service routes. Re high service routes (green on your map). The proportion offering a 15 min service or better during the day has hardly changed in stats. But this is understated by not counting high service corridors and using just 1 route number for large orbital routes. Re middle service routes. These have a lot of potential that you’ve cottoned on to. But they’ve had relatively little attention here as the priority has been on getting a minimum standard for local routes. Things like the 630, 827/828, 513, 527, 406, 664 etc. Would be interesting to compare these across cities. An error in the above – 778 should of course read 780.